The number 1 chore is a bit easier when the laundry room is kept under control. The laundry sorters are great for keeping the colors separated. They are time savers if you add your dirty clothes as you take them off. They can be strategically positioned near bedrooms to facilitate this. 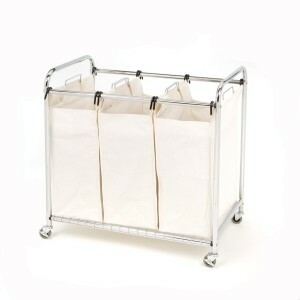 We recommend this Seville Classics 3-Bag Laundry Sorter because it has important qualities. The bags are on hooks and are easily removable. When a bag is full you just take it and dump it into the laundry machine. Other sorters have similar design but the material for the bags is often inferior. The bags here are made of heavy-duty canvas and are very sturdy. This is important quality to look for in a sorter because the bags get heavy when full. Another important thing that this sorter has is the wire grid bottom shelf for added support. It also moves on wheels and can be easily repositioned even when fully loaded. Seville Classics offers the same sorter with a top rack for hanging clothes. This is perfect if you like to leave some clothes damp to air dry. You can check out all laundry sorters on Amazon. Pay attention to the dimensions: some 4-bag sorters are not much wider than the 3-bag ones. Effectively the bags are just smaller. Whether you want to save on energy bill or have to let some garments air dry, the clothes rack is an easy solution. There are free-standing and wall-mounted drying racks for the laundry room. This wall mounted Polder accordion rack is 24″ wide and expands to 18″. It has 7 rods for hanging clothes. When not in use the rack can be pushed back to the wall. It comes with mounting brackets and if you mount it on 2 studs (some houses have 24″ distance between them) the rack can support a lot of weight (up to 22 lbs). If your studs are 16″ apart try to get it on at least 1 stud. In this case you can safely dry lighter items, such as shirts, socks and undergarments. 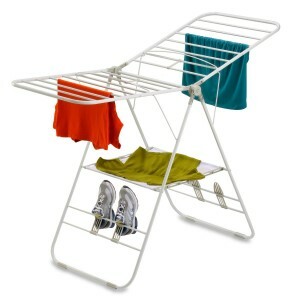 The Honey-Can-Do freestanding drying rack can be folded when not in use. It is sturdy and can support heavy items. When fully extended it measures 64″. The wings are adjustable and can go high enough to allow for hanging pants (when put flat the wings are 42″ from the ground). There are also shoe holders on each side. Typically, the cleaning supplies and detergents are stored in the laundry room. A good place to put them are shelves on the wall or a mobile cart. If you prefer the shelves there are kits like this HyLoft one. It is 45″ long and 15″ wide. Home Depot sells similar system with solid boards for the shelves. 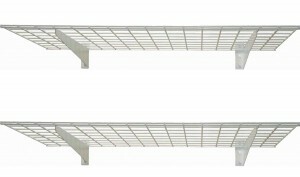 The HyLoft shelves are offered in a few more sizes as well. When adding shelves to the wall is not an option the mobile carts are good solution. 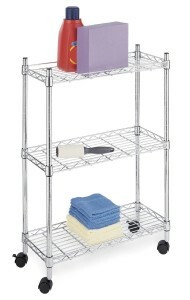 This Whitmor steel laundry cart provides ample room for storage on its three 13.2″ wide shelves. It is 33″ tall and 22.5″ wide. The assembly is very easy and requires no tools. Take a look at other laundry carts on Amazon. When choosing one pay attention to the dimensions because some are too narrow and large bottles of detergent won’t fit in. I got this laundry sorter as a gift from my MIL and I am really happy with it. I am thinking of adding a second one. 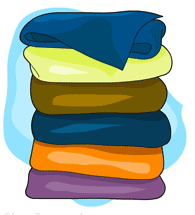 I came across your site and after reading this i am gonna buy myself a laundry sorter.